ISLAMABAD: Kabul has threatened to shut the Afghan transit route for Pakistani exports to Central Asia if Islamabad does not allow Afghan traders to use Lahore’s Wagah border for trade with India. “If Pakistan does not allow Afghan traders to use the Wagah border for imports and exports of their goods, Afghanistan will also not allow Pakistan to use Afghan transit routes to reach Central Asia and other countries for exports,” President Ashraf Ghani said in a meeting with UK’s special envoy for Afghanistan and Pakistan Owen Jenkins in Kabul. 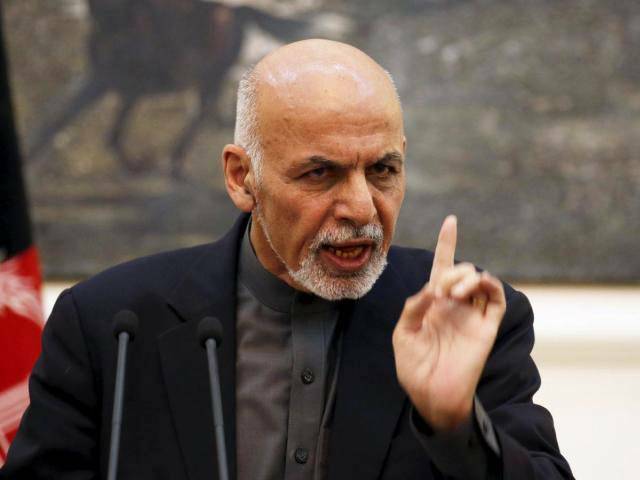 “Afghanistan is no more a landlocked country as it has many transit routes for the import and export of goods,” Ghani added, according to a Pashto-language statement posted on Friday by the president’s website. The remarks came amid tension between the two uneasy neighbours over several issues and particularly in the backdrop of Pakistan’s decision to introduce a new mechanism at its Torkham border that requires every Afghan to carry passport and visa for crossing the border. “Pakistan has always shut its routes on Afghanistan’s fresh fruit, causing loss of millions of dollars to our traders,” the Afghan president said. He added that Afghanistan was making efforts to boost economic cooperation in the region and wanted Pakistan and other regional countries to remove all technical problems that create obstacles in economic cooperation. When contacted, a Foreign Office official refused to comment on Ghani’s statement, saying a response will be given after due consultations. Afghan officials said Kabul has long been demanding the use of Pakistan’s land route to deliver goods at the Indian border town of Attari via Wagah. However, Pakistan is reluctant to grant such permission in view of the state of its relations with New Delhi. Afghan sources insist that Afghan goods, mostly fresh fruits go up to Wagah but then it is not allowed to go up to Attari. “It is offloaded in Wagah and then carried in carts up to Attari and loaded on again. This adds to transportation cost as well as to a significant spoilage,” an Afghan source said. “We have asked that our goods mostly fresh fruit be allowed to go up to Attari and then transferred to Indian trucks in a back to back arrangement. This alone can reduce cost and spoilage to an extent that will make our export of fruit to India double or triple,” he said. Ghani also obliquely accused Pakistan of sponsoring terrorism, saying the recently organised and well-coordinated terrorist attacks showed that the terrorists receive aid from outside. “Support to the terrorist groups is an action contrary to the good neighbourhood and all international norms and action of the neighbouring country is no more acceptable to the people and gov’t of Afghanistan,” he was quoted as saying. “We will use diplomatic channels to stop all efforts to destabilise Afghanistan through terrorist groups. I want our message should be conveyed to Pakistan,” the Afghan leaders further said. On his part the British envoy said his country will support the Afghan-led intra-Afghan dialogue and will keep on efforts along with the regional countries. Pakistani officials say repatriation of the refugees could gain momentum and that many would return this and next year. Published in The Express Tribune, September 10th, 2016. Lets open it and let the afghans flood india with there national food( cocaine hasish and all sorts of drugs).we pakistanis opened our borders and payed a heavy price.time for the indians to pay a price too of the new love relationship. Pakistan should be jumping the band wagon in ensuring trade to Afghanistan instead of closing borders and creating hurdles. It will be the day when Iran-Afghan road and link is created, and we will be left lurking. CPEC should have an “A” in it a well. Bypass Afghnistan and block it from CPEC benefits. Use Iran to connect central asia. Afghanistan is an indian state now just like bangladesh so throw it out from friend list. 2) Pakistan shouldn’t mind blocking Chaman and Torkham border for goods you receive through these routes. @AD: Let them use Chah Bahar seaport, in fact, why are they not already using it? Afghans are too dumb to understand their friends and foes, Mr. Ghani speaks what their so called friends asked him to deliver, they will use you and flush like anything and the time is near to show the consequences of keeping them your allies. Afghanistan-India trade relations are very old. Even short stories were written about it. (Kabuliwala) some “unnatural” elements are now trying to block it now. This clearly says how great Pakistan is doing recently, no need any kind arguments and this information is right in front of your eyes on front page of tribune.com.pk ! Send afghans refugees back to their home country. No mercy for Afghan Taliban. Business is the only way nowadays where you can make a friend or foe , its your interest with other nations to make relationship . it will be in the flavour of People of both countries if they give way across their borders to other nations. Trade bw Afg and India is a bilateral issue. It is the right of way that is issue. Our country is being threatened by Indian Terrorism. Ashraf Ghani I think cannot convince Modi to give Kashmiris right to self determination. Easy way for Afg is to use air tranport for trade with India. You cannot accuse , threatened and then ask for trade route. First of all Afg President should correct his tone. Pakistan should deport all Afghans immediately. Call their bluff! Afghanistan needs to stop being India’s little b** and realize that Pakistan will not allow these things to please the Indians who are murdering Kashmiris everyday. I am a Pukhtun from Pukhtunkhwa and I say keep on dreaming. Pukhtunkhwa is Pakistan and will remain that way. Pukhtunkhwa, NWFP back in days, was betrayed by India in 1947 and abandoned by Afghanistan during Anglo-Afghan war and we are NOT up for anyone to be claimed.